Get a head start for the Super Weekend’s hottest football action with the Live Betting Offer. Every weekend at Betsson Sports you can earn the €5 Risk Free Live Bet with the Live Betting Offer, allowing you to capitalize on the top seven European leagues and one South American league. All you have to do is place a €10 wager on any sporting market during the regular week to get the €5 Live Betting Offer for use on the select football leagues over the Super Weekend: Premier League, Bundesliga, La LIga, Serie A, Ligue 1, Ekstraklasa, Peruvian Primera Division and Eredivisie. With a total of eight different leagues to use the Live Betting Offer on, your Super Weekend could easily turn into an Amazing Betting Weekend, if you make the right football bets. Wager on your favourite sporting events throughout the week all the way until May 21, 2017, to see yourself collect the €5 Risk Free Live Bet every single weekend with the Live Betting Offer. NOTE: to qualify for the €5 Live Betting Offer, ensure that you have placed at least €10 worth of bets over the course of the week with minimum odds of 1.50 (1/2) on each market. Also, make sure to put your €5 Risk Free Live Bet to use during the weekend (00:01 CET Saturday – 23:59 CET Sunday) on any of the eight football leagues. On top of the sports betting offer, you also have the chance to collect 10 Free Spins on Wild Wild West slot at Betsson Casino, for all your online casinos enthusiasts. But just make sure to use the Free Spins until 23:59 CET this Sunday (January 29), so they doesn’t go to waste. The Free Spins will likely be applicable to a different online slot every Super Weekend, so it gives you a chance to try out different ‘reel’ games every new weekend at the online casino. 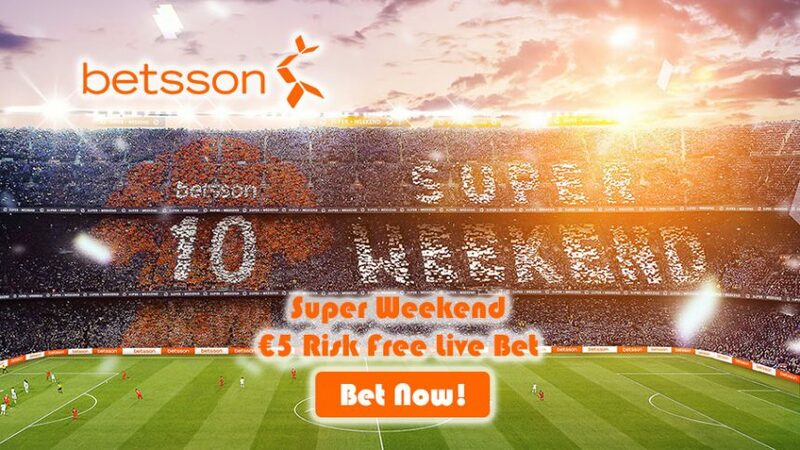 Join Betsson Sports now and grab your €5 Risk Free Live Bet every Super Weekend with the Live Betting Offer. And don’t forget that this promotion also involves you getting a Free Spins for a special online slot at Betsson Casino. Collect your Live Betting Offer for the weekend action!